A developer wants to build a large subdivision just outside the Smithfield city limits. The Smithfield Town Council will consider a request in December to approve a 110 lot subdivision on a 97.57 acre tract of land at 1337 Cleveland Road, at the intersection of Cleveland Road and Swift Creek Road. The property is in the town’s extraterritorial jurisdiction (ETJ). Last Investments LLC of Clayton is proposing lot sizes of 0.46 to 1.72 acres. Two of the lots do not meet the Town’s minimum lot size of 100 feet by 200 feet. A cemetery is currently located on the northern edge of the property. Town staff is recommending the council require the developer to provide a 30 foot recorded easement to the cemetery. The Town of Smithfield would provide water service to the subdivision. Each lot will have on-site septic systems. Duke Energy would provide electricity. According to a town report, the developer has indicated the first phase of the subdivision would consist of approximately 20 lots. The Smithfield Planning Board reviewed the application on October 4th. 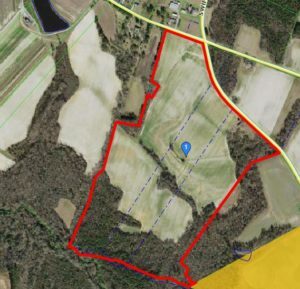 The planning board expressed concern about the lack of a phasing plan, subdivision signs and landscaping and only one entrance off Swift Creek Road into the development. The planning board recommended approval of the subdivision but with 8 conditions including a second entrance, eliminating the two lots that do not meet minimum size, HOA documents be submitted to the town attorney for review, submission of a lighting plan prior to construction, proof of legal access to the cemetery, a phasing plan, and an emergency entrance onto Swift Creek Road with a crash gate. The subdivision request was initially set to go before the Smithfield Town Council for consideration on November 6th but has been postponed until the December 4th meeting.